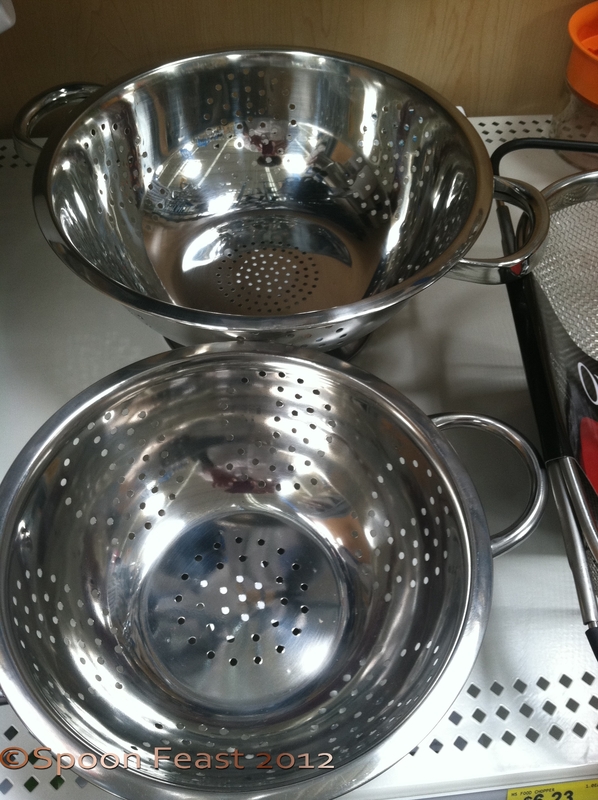 Colanders are those strainers you use to drain larger amounts of liquid from things. Colanders stand alone, you do not need to hold them like you do a strainer. They can be made from heavy-duty plastic, ceramic, stainless steel, aluminum, copper etc. I bought one from an artist friend once. This colander was ceramic, hand painted and unique. 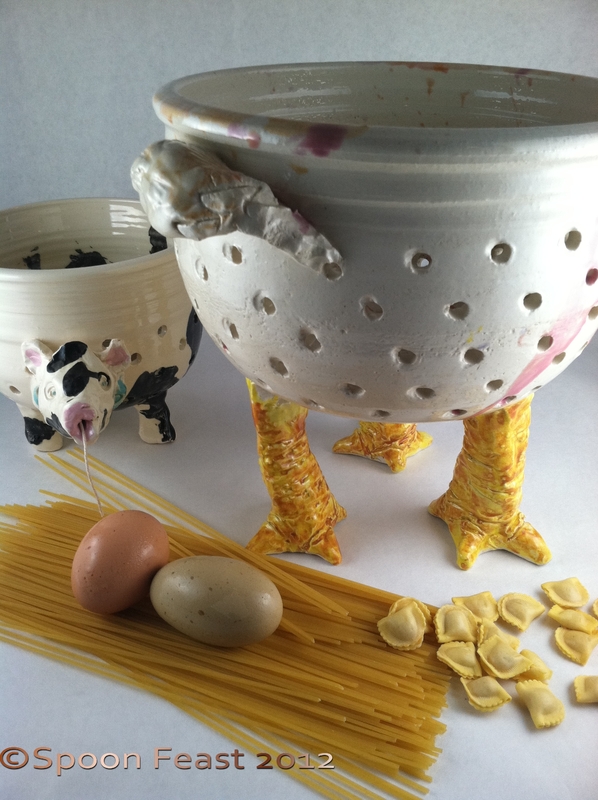 It had three chicken legs styled out of clay; the bottom half of the bird was all there was, it was white and the handles were the birds wings. Chickens don’t have very big wings. 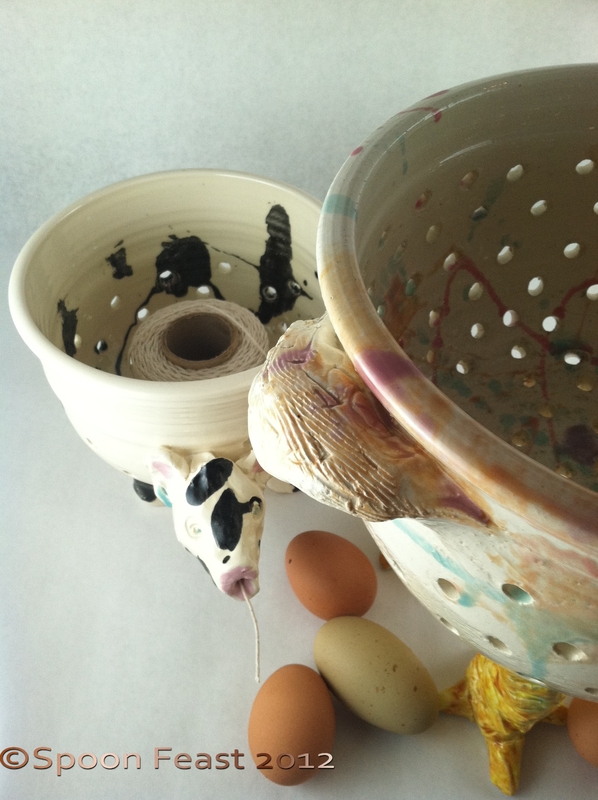 I couldn’t resist the cow colander either. I like funky kitchen stuff sometimes. If it makes me smile, it gets a place in common use. 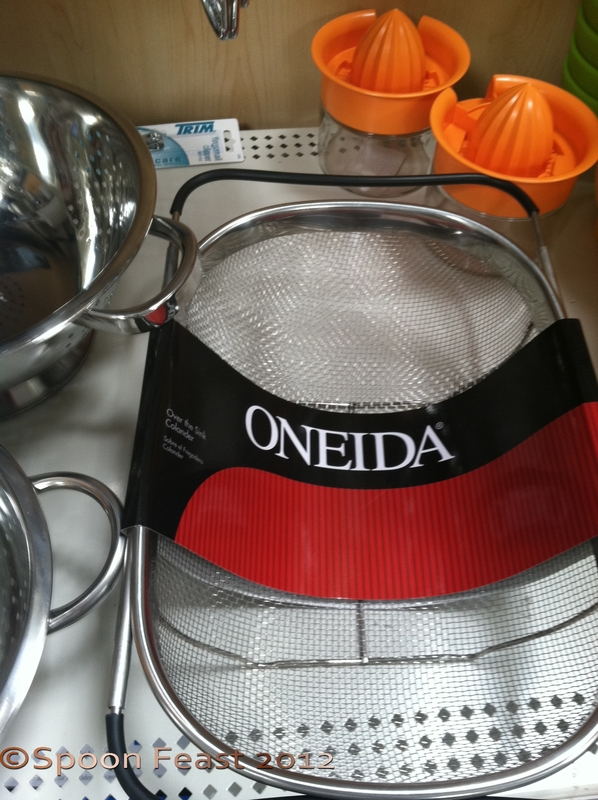 This colander made me laugh so I bought it. It earned an esteemed spot on the kitchen counter for a while. Finally time to use it. I place it carefully in the bottom of the sink and drained the pasta in the colander. I was totally beside myself and wondered why it didn’t dawn on me before that exact moment how I expected it to look. Well, what happened was not what I thought it would be. The chicken looked as if it were peeing all over itself; peeing like a racehorse. That’s just not right. That imagery was all wrong. My fun time with the chicken colander was over. 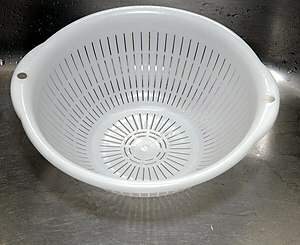 I drained the pasta, washed and dried the colander. It holds a place in the background of my TV show set. It is no longer used actively. Last I checked, it held several balls of butchers twine. The holes in the body (the perforations for the colander) are perfect twine guides. Thread it through a hole, pull as you need. Only on the TV show though. I can’t have peeing animals in my kitchen. When it comes to kitchen tools, you get what you pay for. If you buy artisan, you can also get a show. Make sure there are lots of small holes. Small enough to retain peas. Any larger and you limit the colanders use. Make sure the sides and bottom have holes, not just the bottom. Will it fit in your sink? If not, where are you doing to use it? Will it fit into the dishwasher? You can store the colander with the nested stainless mixing bowls. If you tire of your colander, you can always line it with sheet moss, fill it with dirt and plant herbs or flowers in it. Of course you will need a tray under it to catch any drips from watering. 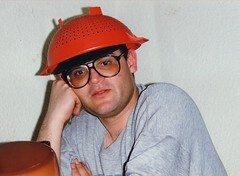 No matter what, do not allow your friends to convince you a colander makes a good party hat. It does not and you will regret any resulting photos. This entry was posted in basic skills, Cooking Quickies, Cooking Thoughts, To Tyler: How to Cook: and tagged butchers twine, Colander, cook, cooking, Home, Kitchen, Sieve, Stainless steel, strainers. Bookmark the permalink. 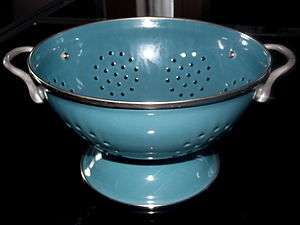 For some strange reason, my hubby likes calling a colander a coriander. Great variety here my friend! I just have a simple stainless steel one that isn’t too big or too small. The one I use all the time is a stainless one I have had more years than I care to remember. It seems to be indestructible.